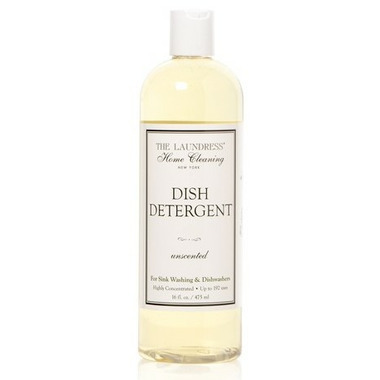 The Laundress Dish Detergent is a single low-sudsing detergent to thoroughly clean your dishes, whether you’re washing them by hand or in the dishwasher. That’s one less bottle to store under your sink! Formulated with a high percentage of active ingredients (including natural cleaning enzymes), this unique product works on contact to remove grease, baked-on food, and cooking messes. This product is unscented for better performance. Ideal for: everyday dishwashing by hand and in the dishwasher, removing grease, baked-on food, and cooking messes on dishware, cookware, glassware, fine china, and crystal. For handwashing dishes: Fill a basin with hot water. Add a squirt of detergent to create a suds bath. Wash dishes, then rinse. Or, add a small squirt of detergent to a Linen Knit Dish Cloth. Then, lather and rinse. For dishwashers: Add only one capful of detergent to your dispenser. Do not overfill as this product is highly concentrated. Always separate stainless steel from silver when washing. Ingredients: Plant-derived nonionic surfactants, mineral-derived cleaning enhancer (sodium gluconate), plant-derived grease-cutting agent (triethyl citrate), and food- and grease-removing enzymes (amylase, protease). Does a great job cleaning dishes. Lathers well, a little bit goes a long way.